Steven Flagg is an agent for the CIA. A member in very good standing in that agency, he is, more specifically, an operative working in their "E" Department, the "E" supposedly standing for Elimination. 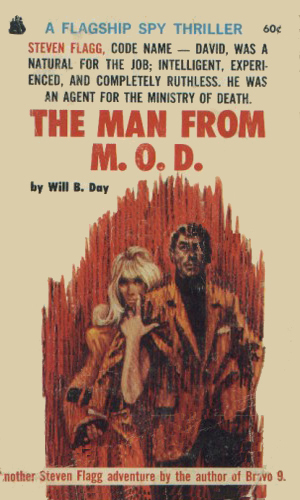 This section also has the nickname of "Ministry Of Death" (or M.O.D.). M.O.D. is the department responsible for any wet work needed by the Agency and its agents are highest on the list of those killed in action as they go where the most danger is. This department, run by a man named Edward Charles but referred to constantly as the Old Man, is known by only three people, the Director of the CIA, the Deputy Director of Operations, and the President. It does not officially exist and it definitely does not have its offices in the then new facilities in Langley but instead remains in the Foggy Bottom section of D.C., its entrance disguised as a small flower shop. From there an operative would go to the back room, open a reinforced door with a number-lock on it, go down a long flight of stairs and then walk the quarter-mile tunnel to the basement of a tall office building where the officers truly were. Flagg's codename in the section is David. He is one of 19 agents that make up the E Department. Flagg is thirty years old at the start of the series and has served in E Department for several already. While very good at it, he is living proof of the perils of his profession as shown by the fact that as the series begins, he has just recovered from three gun shot wounds and is coming out of his remedial training to be certified fit. He is incredibly confident, surprising since he was shot and almost killed, and faces every mission with certainty. He is brass without being overly cocky. 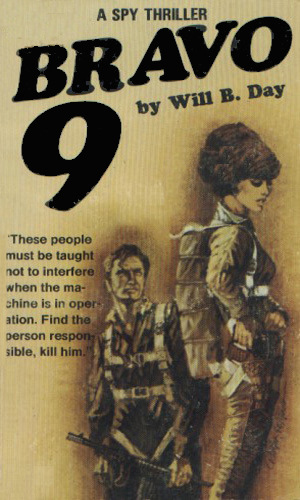 Bravo 9 was the codename for the Cuban rebels hiding in the mountains trying to do to Castro what he did to Batista. Ellen was the codename for the female operative the CIA sent to help them but she was captured. Now Steven Flagg is sent in to get her out or eliminate her. 2 The Man From M.O.D. The identity of the man responsible for several CIA agents' deaths over the past few years is now known. He is a major player in the East German Intelligence organization and he is Steven Flagg's next target. But he has been a target many times and the only ones dying are the attackers. In the same era that saw the creation of other larger-than-life, no-risk-is-too-great super-spies like Nick Carter, Killmaster, numerous would-be killmasters also came out, as is common. The me-too crowd definitely includes Steven Flagg, codenamed David. He has the same feel as Carter although his history and his department leans closer to Matt Helm's side of the ledger. Flagg is no Helm but luckily, no Killmaster, either. The two books are B-movie style adventures and if you read them as that, you'll like them. I did.